Based on reconstructions appearing in museums, book illustrations, and movies, we have long envisioned Neanderthals to be stooped-over and inarticulate brutes, with hair enveloping their ape-like features. However, a growing body of evidence accumulating in recent years supports the notion that they walked upright, communicated by speech, used tools, buried their dead, had a cranial capacity that was equivalent to or even larger than our own, and had no more facial hair than modern man. In 2013, a 120,000-year old Neanderthal fossil was found, with clues that its owner had fibrous dysplasia, a cancer seen in modern humans. Contemporary museum reconstructions of Neanderthals now more closely resemble modern Europeans but with larger skulls, low foreheads, no chin, heavily built bones, and much stronger hands and arms. In 1829, Philippe-Charles Schmerling discovered the first fossil remains of a Neanderthal—that of a small child—in a cave in present-day Belgium, although it was not so identified until 1936. The first recognized fossil human form was uncovered in 1856 in Neander’s Valley in Germany and was called Neanderthal (thal = “valley”), and since then, other remains have been found in Western Europe, the Near East, and Siberia. The Neanderthals lived some 600,000 to 350,000 years ago, numbering, at their peak, about 70,000 in Europe. Then, around 30,000 to 45,000 years ago, they became extinct from causes that have yet to be more than speculation and theory—which also seems the case for what we “know” or think we know about them. DNA findings suggest that Neanderthals and Homo sapiens diverged from a common ancestor some 400,000 to 500,000 years ago, and it continues to be debated whether Neanderthals are a subspecies of Homo sapiens (the weight of opinion points to Neanderthals as a separate species). For many thousands of years, Neanderthals lived in the same geographic regions as modern humans, and it appears that they interbred with humans. Some 99.7 percent of Neanderthal DNA is identical to present-day human DNA, and Europeans and Asians derive 1–4 percent of their genes from Neanderthals. SEE ALSO: Primates (c. 65 Million BCE), Anatomically Modern Humans (c. 200,000 BCE), Fossil Record and Evolution (1836), Oldest DNA and Human Evolution (2013). In 1899, Dragutin Gorjanovic-Kramberger (1856–1936), a Croatian geologist, paleontologist, and archeologist, found over 800 Neanderthal fossil remains in Krapina, a town located in northern Croatia. 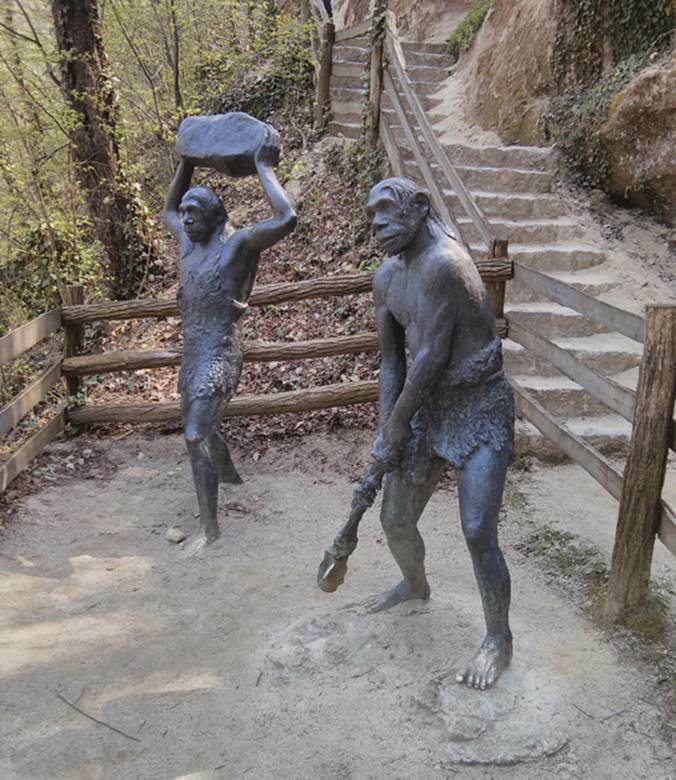 These remains, along with the statues shown here, are found at the Krapina Neanderthal Museum.